Money sure can feel like a rational thing: You earn it, you spend it. (Hopefully you're saving some of it too, but more on that in a minute.) But you are probably making a lot of irrational decisions, too. "Doing money the right way is actually very, very hard," says Dan Ariely, a behavioral economist and professor at Duke University. "Money is all about opportunity cost. Every time we spend money on one thing, we don't have money for something else. Thinking about all the things we're giving up is very complex." In other words, the decisions you're making about money may not be as straightforward as you think. Here are a handful of common psychological traps we may fall into -- and how to help outsmart your brain. What it looks like: You might be guilty of mental accounting if you've ever created a special "money jar" (or account) to set aside savings for a big vacation while still carrying credit card debt. Or refused to spend an inheritance to pay down your student loans. In other words, you treat some money as more special than other money based on subjective criteria, such as how it will be spent or where it came from. "We have trouble taking it all into consideration when we're making decisions in the moment," says Brad Klontz, a financial psychologist and associate professor at Kansas State University. "Instead of looking at our net worth or our assets as being in one bucket, we put them into different buckets, and we attach all sorts of meaning to those buckets that may not be in our best interest in terms of financial health." How to help stop fooling yourself: Since this is an unconscious activity, it can be hard to reverse the tendency. However, you can use mental accounting to your advantage. Research shows that if you create a savings account attached to a very specific savings goal, such as money for a child's college fund, you will save dramatically more for it. Also note that "it is good to set aside money in an emergency savings fund, even if you are carrying credit card debt," says Natalie Taylor, a certified financial planner with LearnVest Planning Services. It's also good to prioritize your financial goals. What it looks like: You estimate the value of something based on irrelevant information (e.g., the "anchor"), such as the price you paid for it, the cost of something else you own or what someone told you it was worth. For example, if you buy a stock for $50, you may tend to "anchor" the value of that stock around that number and feel that the stock is doing well if the price is above that number and doing poorly if it falls below. Similarly, if a salesperson names a price for a used car, you might use that as the standard for the rest of your negotiations, even if the initial price is more than the car is worth. Another example? Stats like the fact that the average American wedding costs $30,000. You might establish your expectations based on that fact, rather than sticking to your own budget. "It's all emotional and tied to our experiences, then we start making judgments based on it," Klontz says. "But it's very arbitrary and individual." How to help stop fooling yourself: Be aware of your mood-and your emotional tendencies. Studies have shown that when we're depressed, we're more likely to fall into the habit of anchoring. Similarly, people who tend to score high in agreeableness and openness on psychological profiles are more susceptible to being swayed. Also, check in with yourself to make sure that logic, not emotion, underlies your spending decisions. An objective professional can give you an idea of the actual value of an item as it compares to the market. What it looks like: Present bias means you have difficulty postponing immediate returns, or delaying gratification. In one famous experiment, researchers put children in a room with a marshmallow and told them that if they didn't eat the marshmallow until the researcher returned, they would get two marshmallows. Guess what? Most of the kids ate the marshmallow. People tend to choose the good option today over the better option tomorrow. This can make saving for future goals -- such as retirement -- tough because we'd probably rather have nice dinners out today. How to help stop fooling yourself: A big part of present bias is emotion -- we want it and we want it now. Excitement and fear can tend to make it worse. "Studies have shown that if you're really scared or excited, it shuts off your prefrontal cortex, which is the part of your brain that needs to be activated so you don't respond in this natural human way," Klontz says. If you're making money decisions when you're emotional, take time to calm yourself and approach a purchase rationally. Is it something you can afford? Is spending this amount of money on this item something you would recommend that a friend do? "It's also helpful to have specific short-term goals paired with long-term goals," says Taylor, "For example, every time I put a dollar toward retirement, I put 50 cents into my 'fun' account." What it looks like: People usually prefer the things they know over the things they don't know, even if other options are superior. For instance, if you've always had your 401(k) money in one mutual fund, you may be resistant to moving it to another mutual fund, even if the other option is a better choice. "The definition of stress is any change to which we need to adapt," Klontz says. How to help stop fooling yourself: Bring in a professional. 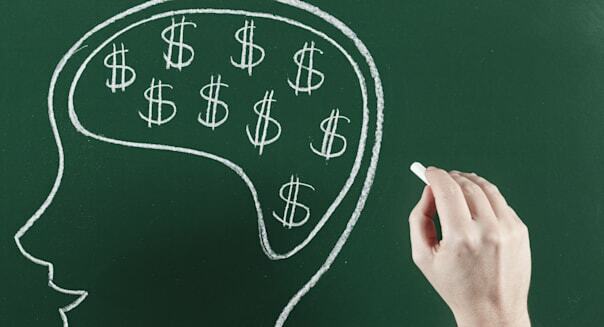 Recognize that your brain is probably going to steer you toward the wrong investment choices, but that a financial planner isn't emotionally tied to your stocks and bonds. "You have to distrust your instinctual automatic response," Klontz says. "You have this force inside you that will try to sabotage you by making these predictable errors that are irrational." What it looks like: We may overestimate our ability to resist temptation. Someone who is trying to curb spending may still go shopping with friends or leave three credit cards in her wallet, and when she spots a cute pair of shoes, her restraint can go right out the window. The problem is, we have a finite amount of self-control, and we can deplete our reserves. "If you've just successfully resisted temptation at dinner, then you go shopping, you may be less self-controlled than if you'd skipped dinner," explains Cunningham. %VIRTUAL-article-sponsoredlinks%How to help stop fooling yourself: One tip is to not deplete your willpower. In other words, the fewer decisions about money we need to make every day, the more likely we may be to make smarter choices. That's why you should consider "paying yourself first," to help make sure your money goes toward your most important goals. By automating your savings and retirement contributions, you probably won't be confronted with the decision to put that $200 toward your 401(k) or a night out on the town. What it looks like: You may tend to place a higher value on the things you own, because you own them. For instance, someone who has decades of happy memories of a house will probably be likely to inflate the value of the home beyond what the market will pay for it. You may also find that people selling things secondhand have an unrealistic idea of what something is worth. How to help stop fooling yourself: Have an item you want to sell appraised by a professional, or do the research and see what the market is paying. What it looks like: In general, consumers tend to gravitate toward products and investments that they know over unknown options, which may be better. "People do this with their own company stock all the time, where they have a large position in it but they feel good about it because it's familiar," Klontz says. "They overestimate the health of the company because they work there." How to help stop fooling yourself: Diversify. Consider taking an objective look at your portfolio -- or have an adviser do it. "And don't feel like you have to get super-exotic to earn a solid investment return," says Taylor. "You can get great low-fee, high-quality and well-diversified investment options through larger brokerage firms without having to go search out a small, lesser-known company.